Jakarta is losing the international perceptions game. It took 24 hours—and apparently an angry call from a blindsided President Joko Widodo—for Home Affairs Minister Tjahjo Kumolo to revoke a raft of new restrictions on visiting foreign journalists, which were similar to those in force during President Suharto’s 32-year rule. Why they were introduced in the first place is difficult to understand in the current democratic climate, but it showed once again the mixed signals emanating from the Widodo government when it comes to Indonesia’s dealings with the rest of the world. Cabinet reshuffles or not, the president will have to work harder at ensuring there’s a lot more policy coordination and a lot less economic nationalism if he is to achieve his goal of attracting foreign investment and bringing a better balance to the economy. New manufacturing industries are vital for sopping up unemployment and steering the country away from its past dependence on natural resources and onto a growth path that will propel it above the current 5%. 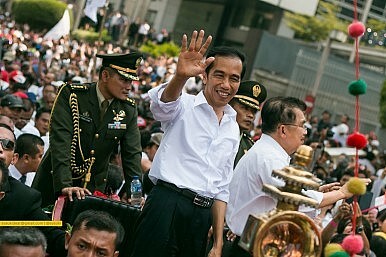 Right now, Indonesia is going nowhere fast, offering a welcoming hand in one instance and an arresting hand the next. It’s left the overriding impression that because of the size of its domestic market—and the profits to be gained from it—everything has to be on its terms. It wasn’t always like this. In the years following the 1997 financial crisis, Indonesians were in despair, wondering where they had gone wrong and why it was taking so long for the country to recover. The arrival of the 2004–2012 commodity boom changed all that. Officials trot out figures which appear to show productive foreign investment pouring in. But ask any foreign business group or investment bank analyst and they leave no doubt that investors have Indonesia firmly on the back burner. There are different reasons for this. Admittedly, many center on the general economic slowdown, with commodity prices still in the doldrums, domestic consumption sinking and a sluggish China weighing down hopes of an imminent world-wide recovery. But that’s not all. In private forums, businessmen complain about regulatory uncertainty and cloying red tape; they talk of ministries working at cross-purposes and the economic coordinating minister seemingly incapable of getting them on the same page. In places like Malaysia and China, start-up ventures are lavished with new buildings, modern technology and attractive incentives. In Indonesia, there’s nothing but bureaucratic obstacles, poor infrastructure and a take-it-or-leave-it attitude among senior officials. One large global company, for example, still can’t secure approval to import a common agriculture commodity for its processing plant—a necessary contingency plan in the event that Indonesia is unable to produce enough to keep it running at full capacity in the future. Two Korean companies hoping to set up garment and shoe factories in Central Java to take advantage of cheaper labour costs found they had acquired land that was either in the middle of nowhere or not zoned for industrial use. The list of gripes go on, topped by the Manpower Ministry’s policy of slashing work permits and its recent decision to force all non-resident directors and commissioners to obtain temporary permits, whether they attend meetings in Indonesia or not. Like the media restrictions, you would think it would take only a phone call to resolve. Instead, Widodo demonstrated his ignorance of procedures by saying he wanted to scrap temporary stay visas. That would leave the related work permit issue untouched. Foremost among the mixed signals is the Government’s fixation on adding to the so-called Negative List—sectors where foreigners aren’t permitted. Yet even in areas where foreign investors are encouraged, such as the creative economy, they’re only allowed minority ownership. Another complaint is the Government’s requirement for foreign-owned projects to use local content. It’s not that it can’t be done, but the way officials beat investors over the head with it. Similarly with a new requirement for all companies engaged in public service to build data centers, even if there is no need for them. In this climate, the targeted incentives on offer in neighboring countries are almost unheard of. Instead, by far the most common complaint is the whimsical introduction of regulations, which are both unclear and lacking in the certainty necessary for business plans to work. A classic template is the 2009 Mining Law, the broad provisions of which were initially greeted with cautious enthusiasm. Then three years later, the Government came up with implementing regulations that changed everything, giving miners an impossible year-long deadline to build smelters. Instead of facing up to reality, Indonesia plays its now-familiar game of smoke and mirrors. Beef prices are at record levels because the Government continues to restrict meat and live cattle imports in an effort to show it has attained self-sufficiency. It hasn’t and it probably never will. Indonesians are assured that the looming El Nino weather phenomenon, which meteorologists are warning could be even worse than the devastating 1997–98 event, will have little impact on agriculture. But the impacts are already being felt, and no-one knows how much more is to come. Then there was the recent spectacle of President Widodo attending the ground-breaking ceremony for a 2,000-megawatt Japanese-funded power station, hailing it as an example of the Government removing bottlenecks to infrastructure development. Yet buried in the stories appearing in local newspapers was the revelation, well-known to most people who follow the power industry, that developers still have to win a years-long battle to acquire a crucial 10% of the land. For all the bluster aimed at a gullible domestic audience, Indonesia is losing the perception game where it counts: out in the world. But before new chief economic minister Darmin Nasution can come up with ways to turn that around, he must first convince ministers and bureaucrats alike that carrots work better than sticks. John McBeth is a Jakarta-based correspondent who has covered Southeast Asian politics for more than 40 years. This was originally published over at The Australian Strategic Policy Initute blog The Strategist. Jakarta has outlined its foreign policy priorities. Actually achieving them could be a challenge.